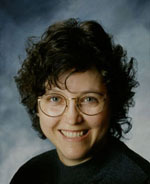 Benjamin Radford is deputy editor of Skeptical Inquirer science magazine and a Research Fellow with the Committee for Skeptical Inquiry. He has seen his nonfiction work published in over 20 books (as author, co-author, or contributor) and has written thousands of articles on topics such as urban legends, mysterious phenomena, critical thinking, and media literacy. His newest release is the award-winning Investigating Ghosts: The Scientific Search for Spirits (2018). You’ll find Ben on his website at BenjaminRadford.com and on Facebook and Twitter. For a list of all his books stop by his Amazon author page. What is your elevator pitch for Investigating Ghosts? Investigating Ghosts is an in-depth look at scientific attempts to contact the dead, from historical, cultural, and folkloric perspectives. From Shakespeare to the Victorian era to modern-day ghost hunting, people have always tried to find ghosts, and this is a look at their methods and how to bring science to them. I’m open-minded but skeptical. This book is a culmination of about 20 years of research and investigation into the subject, and it’s probably one of the broadest topics I’ve written about. My previous books were often on narrower topics (such as New Mexico mysteries, the chupacabra vampire, and evil clowns) which allowed me to do a deep dive and analysis into them. But with ghosts, there’s an enormous amount of information I needed to tackle, from early ghost-based religions (such as Spiritualism) to ghost folklore, the psychology of a ghost experience, ghost hunting devices, ghost photos, the scientific process, and so on. In all these cases I wanted to bring something new to it, not just copy and paste information or third-hand sources but give readers factual, science-based information. That’s why there are eight pages of references; it’s not just a book of spooky, told-as-true ghost stories, but evidence-based analyses, including my own investigations. Even with all that, I couldn’t get everything into 320 pages. 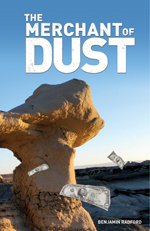 Throughout the book I describe my firsthand investigations, including many here in New Mexico. I’m not just an armchair investigator! I love to get out in the field, go to haunted locations, interview witnesses, examine evidence, and try to figure out what’s going on. So I enjoyed describing some of the investigations, for example at the KiMo theater, the Albuquerque Press Club, courthouses in Santa Fe and Espanola, the tiny town of Cuchillo, and so on. I have also done haunted house investigations for television shows in Los Angeles, Jamaica, Canada, and other countries. It’s part memoir, which was fun, and I’m especially pleased it won the New Mexico/Arizona Book Award. 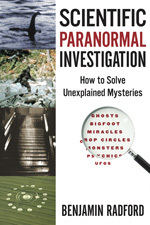 Investigating Ghosts is actually a follow-up to a previous book titled Scientific Paranormal Investigation: How to Solve Unexplained Mysteries which came out in 2010. In that book I cover pretty much what the title states: How to investigate—and more importantly, solve—seemingly unexplained mysteries. I cover a wide variety of phenomenon, including crop circles, lake monsters, psychic detectives, and ghosts. But I realized that ghosts are so popular, and such an often-investigated phenomenon, that they really deserved their own book. There really are many different aspects to ghost investigation (photos, experiences, so-called EVP or ghostly voices, etc.) that I couldn’t do it justice in just a chapter or a few articles. Plus I kept meeting well-intended amateur ghost hunters who were going about it in completely the wrong way—often influenced, unfortunately, by “reality” TV shows—and honestly I felt badly for them. 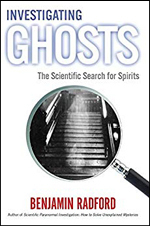 This book is partly an attempt to help sincere ghost investigators, whether skeptic or believer, to improve their methods so that if ghosts do exist, it can be proven. Or, by the same token, if ghosts aren’t real, we can help prove that, too. Do you have a favorite quote you’d like to share from Investigating Ghosts? Any “Oh, wow!” moments when doing research for the book? I think what surprised me most was the variety of phenomena that can be, and have been, mistaken for ghosts. When most people think of ghosts they imagine dramatic depictions on television and in films, but in fact most ghostly phenomena are very mundane and subtle. It’s more like missing keys, feeling watched, or odd sounds and odors. For many people, ghosts are comforting, not scary. Of the eleven nonfiction books you’ve written, which one was the most satisfying to write? 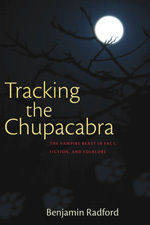 I’d have to say my 2011 book Tracking the Chupacabra: The Vampire Beast in Fact, Fiction, and Folklore (University of New Mexico Press, 2011) is probably among my favorites. It was challenging because it took me five years to investigate and another year to write. But it’s by far the highest-profile mystery I’ve ever solved. It’s satisfying to be able to do good research and bring it all together into a sort of real-life vampire mystery. Plus the book has sections of memoir, such as my experiences in the jungles of Puerto Rico and Nicaragua looking for the creatures. I need silence to work and write. I’m always jealous of, and astonished by, people who can somehow write amid chaos. I begin by determining the scope of the book, so that I have a clear picture of what’s relevant and what’s not. I usually outline the books, at least informally, and make changes as I go along. I usually do about four drafts: the first is just to get the words on the screen, the second is to organize them, and the third is more editing. Then I print out a hardcopy of each chapter and edit with a red pen, like an old-school copyeditor. It gives me a tactile sense of working the words. Then I make those changes on the computer files, and set it aside for a week or two. Then I come back and do another few rounds of edits, and with any luck I’m 90% of the way there. The last 10% is always the hardest, for some reason. How do you choose which writing project to tackle next? I’ve been fortunate that as a writer I’ve mostly been able to choose projects that interest me and that I’m passionate about. I have to, since I often spend years on them and I’ve only got so many years, so many books in me. I’ve done plenty of freelance writing, but I don’t think I could do a whole book unless it was something I cared about. Although if it was a huge check, I could probably make myself care enough to do a good job and get through it… That’s what a writer does; you can’t wait for the muse to sing. As Tom Waits says, you “got to get behind the mule in the morning and plow.” So I do that, but I choose which field to plow. You released a dark satire, The Merchant of Dust, in 2015. How did your experience writing fiction compare to writing nonfiction? I enjoy both fiction and nonfiction, but of course they’re different beasts. I hope to return to fiction someday, but for now I’ve made my niche in nonfiction. I wrote a first novel set in Ecuador titled Jungle Green, which—quite justifiably—will never see the light of day. Well, I shouldn’t say that… I think it’s a decent first novel but it’s one of those you have to write before you can write, as they say. Organizing a nonfiction book is much easier than organizing a fiction book, at least for me. There are so many narrative threads to quality fiction, so many things that need to be right, and you have a little more leeway with nonfiction. I’m better at editing and improving other people’s work. Part of that is being an editor for twenty years, and part of that is having the necessary emotional distance to objectively tell what’s good and bad. What is the best advice you’ve received in your writing journey? There’s plenty of writing advice out there, so much to choose from, but one of my favorites is, “Writing is rewriting.” They’re not separate things. Nobody’s prose is good in first draft, I don’t care who you are. You may be typing, you may be scribbling, you may be blurting out words, but you’re not really writing until you’re rewriting, editing, and shaping what you’ve done. I’m working on a long-gestating book about the role of fear in American culture. It’s partly about the politics of fear, but also how science and critical thinking can help improve the world. I’ve been working on it for well over a decade in one form or another, and I’m feeling added pressure to finish it and get it out there because of the current social and political climate. There is light to be found in the dark forest of negativity, but you have to know where and how to look. The book won’t solve the world’s problems, of course, but it might help bring a positive message of unity and optimism if I can help fight phantom fears.